9/8 Cup of Coffee: The DSL Red Sox1 had to wait a day, but they wrapped up the DSL championship with a convincing 8-1 victory. In Game 1 of their respective series, both the Salem Red Sox and Lowell Spinners lost. They will look to stave off elimination Thursday in Game 2 of their series. In the opening game of a best-of-three series, the Pelicans rode a six-run third inning to an easy 8-1 victory. Michael Kopech struggled, going 2 1/3 innings and allowing six runs on five hits and two walks. He struck out five. Anyelo Leclerc added 1 2/3 innings of relief, allowing two runs on five hits and a walk. Jake Cosart, Bobby Poyner, and Trevor Kelley combined for four scoreless innings out of the bullpen. The lone run of the contest for the Red Sox came in the sixth on a Rafael Devers RBI single. Trey Ball will take the mound in Game 2 as the Red Sox look to keep their season alive. Participating in their first playoff game since 2009, the Spinners were unable to get the job done in extra innings. Michael Shawaryn received the start, going 1 2/3 innings and allowing four runs (three earned) on five hits and a walk. Daniel Zandona hurled the next 4 2/3 innings, allowing a run on three hits and a walk while punching out three. Dioscar Romero suffered the loss; he allowed one run on three hits over the game's final 3 2/3 innings. Down, 4-0, in the third, Lowell got on the board thanks to a Tyler Hill RBI single. In the fourth, the Spinners pulled to within a run, scoring single runs on a Carlos Tovar sacrifice fly and a Nick Sciortino ground out. A run-scoring wild pitch in the fifth tied the game, and Lowell took a 5-4 lead in the sixth on another Hill RBI single. After Hudson Valley tied the game in the seventh, the Spinners offense remained quiet. Hill, C.J. Chatham, and Tucker Tubbs each had three hits to lead the Lowell offense. The Spinners will look to stave off elimination Thursday in the best-of-three series. In a continuation of Wednesday's suspended game, the DSL Red Sox poured on the offense to wrap up the DSL championship. They won the series, 3-1. Ritzi Mendoza picked up the win, allowing an unearned run on three hits and a walk while striking out six across five innings. Carlos Cortes hurled two scoreless innings of relief, allowing just a walk while punching out four. Juan Florentino also added two scoreless innings of relief, allowing a hit and striking out four. The Red Sox offense flourished, collecting 16 hits, including three apiece from Carlos Pulido and Marino Campana (pictured, above right). The Red Sox had six extra-base hits despite striking out 12 times. Players of the Night: Marino Campana. 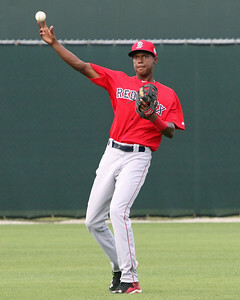 The 18-year-old outfielder was 3 for 5 with two runs scored, a triple, and a run batted in during the DSL Red Sox' 8-1 victory over the Rangers. Campana had spectacular championship series, hitting safely in all four games and producing three-hit contests in Games 3 and 4.